Anyone watching "The Carrie Diaries"? I was so surprised when 3 of my shows in one night had a "warning" for "mature audiences"
Regular TV now has to have ratings? "This is on regular TV?" Hope everyone has a Fantastic Friday!!!! We had a blanket struggle last night! I would never strangle my husband, but I have been known to grab hold of those blankets and jank them back to my side. We have a king sized bed. There are plenty of blankets! I love tea, too! I got Chris a Keurig for Christmas and I use it all the time now to make hot tea every day. Guess it was kind of for me, too! We definitely live in a CRAZY world these days...your stories prove it! We put one of those fruit tea packets in with our big bags of tea to make iced tea. Helps cut out the bitterness. Oh my goodness - - - the SC woman strangling her sleeping partner for his blanket hogging - - - I call that JUSTIFIABLE HOMICIDE! I agree...tv is worrisome. I think The Following sounds creepy even though I love Kevin Bacon. Twinings has a hazelnut chai & almond chai. YS said they're really good. I wouldn't know because he hogged the samples I got in the mail. 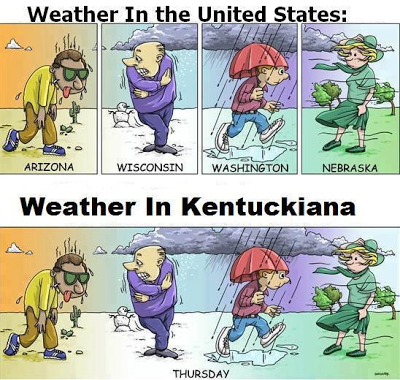 The weather picture is sooo true for the Knox-vegas area, too! I am amazed at the stuff on prime time t.v. now. I often have to send my nine year old out of the room. 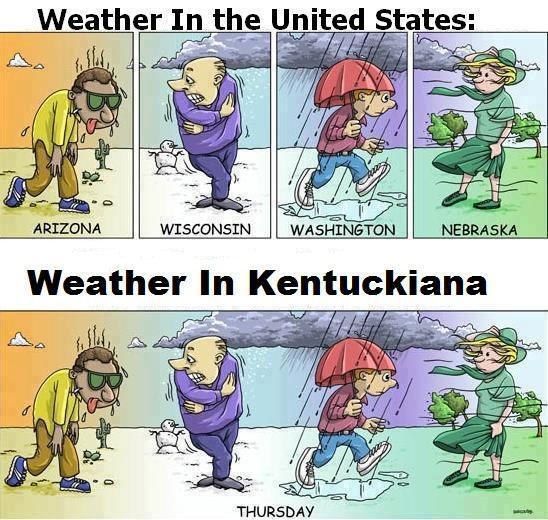 Haha I had to post the Kentuckiana weather cartoon to facebook. Too true. If you don't like the weather, just wait 5 minutes. 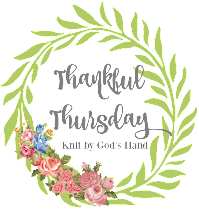 Say, what's that Internet Cafe badge on your sidebar? Yea, I don't think I am missing much without TV here. It should make us a bit nervous that folks are getting so de-sensitised. The bar keeps getting raised on the shock value. I like your short fragments--never watched any of those shows. Its been really cold the last few days and I saw on my phone the high on Monday is suppose to be 71. What? Huh? This weather is so strange. The Diet Coke comment cracked me up... I know that I should give it up, but it's my worst vice. And I figure that if I die, well, I'll die happy. Watched The Following...wow! So violent, but an intriguing story. What sadness, though, to see the girl killed at the end. I kept waiting for Liam to come rescue her!